Feb 23, 2012 Paul, we regret the issues that youâ€™ve experienced with your product post-installation. We have offered to work with you towards a resolution but have been unable to gain your agreement on our offer. We hope you will reconsider. If you would like to discuss further please contact us at customersupport@empiretoday.com or call us at 888-588-2315 x4195. Thank you. Rebekah Clerk, National Customer Service Manager. On 12/5/11 we called Karen to make a complaint about our laminate buckeling . No reply. on 12/7/11 we then called Corp . due to no response talked to Ivan tald him we could not get a hold of karen to make a complaint m he then tried to call Karen him self , but got no response either , he left a message. He told us we would hear from some one in 1 to 3 days. On 12/10/11 Called back talked to Jamie from corp explained problem and no call back in time frame , she said Karen to handle our problem she also called Karen no answer. On 12/12/11 Called Karen could only leave message. On 12/12/11 Dave called us said Rich would come on the 14th or 15th to take care of problem. On 12/14/11 Rich came to look at the floor , said the metal strips the carpet people laided down were the problem , they should of never put them over the laminate , it causes floor not to float. He went backed talked to Karen , he suggestion a different type flooring . Karen called that same day said they will replace the floor , that some times this happens when carpeting is replaced and they use metal strips instead of transitions. We told her the metal strips were orginal from install. On 12/19/11 Rich comes to replace floor with laminate ,all material is in his trailer . He comes in looks at problems with the floor , he starts to pull up carpeting at metal strip to see how far the strip was nailed down. Wife starts to ask questions , remark from him was you keep asking me a 100 questions , I can either do this or leave. Then he made a statemen he could leveling out slight hump he said was due to metal strips binding up the floor . Then he turns around and says I can put this floor in but in 6 months it could do it again. Wife stated why would you do that if you have to keep coming out thats money out of the companies pocket and time out of our lives again. He then said he did not want to be responsable for it doing it again. He then called Karen , then Karen called us .Karen said she would contact corp about different type flooring lvt flooring . We would hear in 2 days. Rich said they would approve it. Two days went by went by we heard nothing , we then called her left a message asked why we heard nothing. On 12/21/11 We called Corp talked to Clarissa due to not hearing from Karen . I asked why we dont get call backs like we`re told. She checked into the computer found nothing in there from Karen to corp about different flooring or problem. In the meantime the floor kept getting worse. I got cut from the transtion peice being cracked , i hit my head from the transition being loose , I pinched my finger from the floor coming out from under the molding. ( wife ) That was all in the hallway. ( Husband ) Hurt his foot from seperation of floor in kitchen , toe hurt from sparp edge in foyer . Helen called said she would get on the case with us . I sent in the mean time emails to crop. 12/22/11 I got a call saying a man named Bob would come to look at the problems , never told where he would be coming from . He shows up , he looks around he said he did not see any danger problems , and said right off the bat it was a joist probkem , We had another work crew here that heard it all and seen what all he did abd didnt do. He was rude , didnt want to listen to us , all he did was out a level on floor , and took about 6 pics. He also stated Rich did not say it was metal strips that caused the problems. I was explaing the kitchen problems he walked out and said corp would get a hold of us in a week or so. I sent more emails. 12/23/11 Roger called to say he was sending someone out Tuesday to oull up floor to check out laminate. He also said he looked at 17 pictures. 12/27/11 Installer called at 9 am , his name was Tom. Showed up at 1030 am he looked at the floor and all the problems there was took about two hours. The gaps , waves,spongyness , chips, uneven sides, moldings in all rooms , tacks sticking up by all transitions,. This guy took the time to listen to us . When he walked in we ask where he was from , meaning what city or office , he stated Belville , we then in the same sentace asked where Bob was from , since we were not told. Tom said this type of floor was not for this type of job abd asked if we considered lvt . We said yes , we were promised that from Karen and Rich , it never happened , he said he would go back and do his best. He never attempted to take up floor. He said he would hopfully be back in 2 hours o show us samples. He gave us his number, we never heard back. Three days later we tried to call him , no answer. Emails were sent to corp again. He also said the different flooring would not give the typ of problems the laninate is. Hed also signed a letter we wrote with all the problems and we signed to give to the Belville office. 12/28/11 Called Corp and talked to David , told himj of the problems and wanted to talke to some one hig up in the company . He gave us the Belville office instead and was Roger. Roger started to yell and was rude , accused us us of obstructing their job from finding out what the problem is with the laminate. He also said Tom told him we were not expecting him. Both are not senile yet! He said he would call back cause he was hearing one side and tghen another side . I told him I had a tape recording , so no lies on our part. He then got more irrate over that. He never ccalled back. More emails to corp. Laura Woods then called said they wanted to resloved the problems. I told her both installers said a different flooring is best then a floating floor. She too said it was a joist problem and would call back the nest day. I reminded her we had people look for a joist probkem we dont have one . 12/29/11 Laura called said they were sending indepdent insection company out to check floor asap. 12/30/11 Got call from Inspect souluations . 1/2 12 he came out to inspect. Rich showed up to check it out , he asked of everything that was wrong incuding if they left it here for two days before install , we said no . It was left in truck while install in June in heat. He said he should hear from Empire in one to two weeks . And if we requested a copy of the report we were intitiled to it. We asked Empire told us no. They gave to different excuses. 1/9/12 Got a call from Laura she said they could come and install laminate on 1/10/12 . I told her we were suppose to get different type flooring installed that was stated by the belville office. The two installers and he inspector that was here. She said ok to lvt material. She said she would have some one call to set up for sales to come to house. She did said we would have to sign off saying if we have a joist probkem they are not resposable and we would have to get it fixed. We have no joist problem , I have no idea what the report says since they refuse to gve it to us. She said everything will be replaced per her in the home. We called compinies about about the problems on the flooring material . 1/10/12 saleserson came out we picked our flooring , we have never heard anything back , no install date , nothing. Floor is worse , we are still dealing with it. They have done nothing to resolve our floor thus far. But words , lies, blackmail. We are entiled to the report , we should not have have to wait almost two months , the report we have gotten on our own on a joist problem and their install and material tells us other wise. What its coming down to is bad material , bad install . Read manufacturs install of all material they did not follow that , its buckeling due to all that not a joist problem. I have to contiue to worry eveyr day on getting hurt one way or another. I refuse to email corp any more. Two months is long enough. A joist will not crwon in one spot , it will do it from one end to the other. This has been nothing but put blame where blame is due on their oart. There is way more to this but typing all is is hard , explations are tough on emails. I just recieved a second blackmail letter saying we can not talk bad about them ever not even to my neighbors or we ger sued. They will replace the new floor but will not honor a waranty . We have to sign saying we will not sue to to injuries , well there no docotor i went to or hospital so that is null and void. When Tom was here he got hurt , did he have to sign any thing ? I bet not . Thats on tape to. Your indepant report says bad material and bad install . Take resposablity. You never should of put this type of flooring in a mobile home . Never should of left the material in the heat for 6 to 8 hours in June . Look on any site even the makers of the material leave in home for 2 to 3 days before install. And since when does a installer answer a complaint , cause Karen is to lazy ? Review #256147 is a subjective opinion of Pap. We were contacted today by Tina which she stated this contacted of not talking bad about Empire , and that we cant sue for injuries and they will not take respoibilty because they think it is a joist problem is a standard contact for any one who gets a upgrade over 500.00. Last night I stayed up to 5 am going over complaints tons of them all over the net. I got so far three replys of people who got upgrades and they did not have a contract to sign like this. They keep saying we have a joist problem , yet the floor is now level , its been level for awhile. Its buckling now in the kitchen.hmmmmmm wonder if we have a joist problem there too ? A joist does not auto fix its self. So we had Steve come over who works on mobile homes and manufactured homes to look at the floor again. Which we pay for each time. The floor is level, he said I tried to tell you no joist problem it was the laminate buckling. But of course your indepenat report says bad material and bad install. 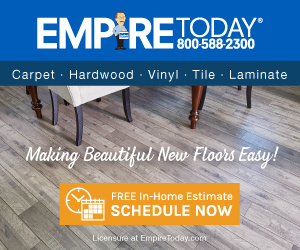 I also talked to the company that sells laminate , LVT and lunoium typo all compinies say to leave the material in home for two to three days , not leave it in the van for 6 to 7 or 8 hours in june in heat. Your material came from China and the box left here says the material was two years old when installed yes it has the date on the box.It also had a code , of which we took to a store to find out what it meant . Hmmmmmmmmmm. You also can not pre aclumate , your warehouse is not the same temp as some ones home or humity . The material has to get used to the home . Getting harrased is bad enough , getting lied to is worse , not asking to listen to the tapes or the taking to the wittness that were here or watching the viedo , or taking to the people that were here to look at the joist or the laminate problem yes we had out own reports. We sent now over 800.00 of our own money. To do this to disabled seniors is horrible. Infact its crule. Empire should be ashmaed they do bussiness like this. But looking at all the complaints one the same as ours , they were rude . I contacted that one case I wanted to know who it was that was rude. Seems to be a pattern.